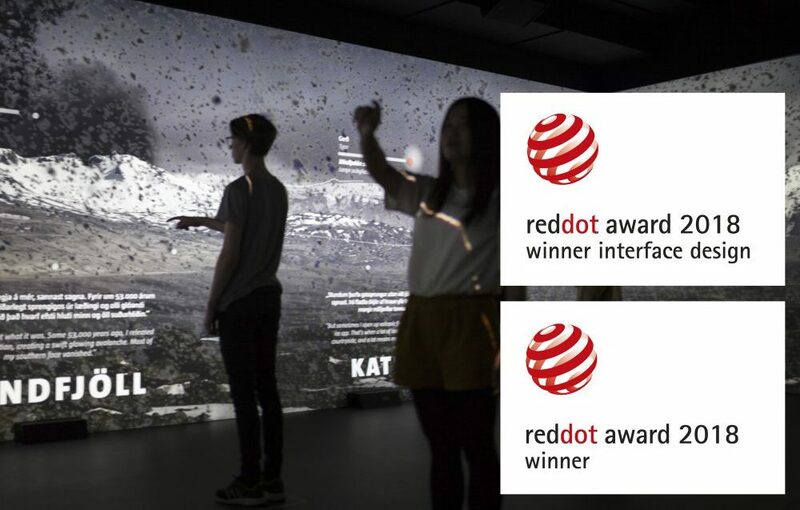 Gagarin and Basalt Architects have been awarded the much-coveted Red Dot as part of the Red Dot Award: Communication Design 2018, the globally renowned design competition for the “Lava Centre” exhibition. The exhibition is awarded in two categories, “User Experience- and Interface Design” and “Exhibition Design”. “The award is an important knowledgement of the quality of work we are doing in a global perspective. A successful interdisciplinary cooperation is a key element to solve complicated design projects like the LAVA Centre,” says Marcos Zotes, from Basalt Architects. Lava Centre exhibition is located at Hvolsvollur, just 100 km east of Reykjavík and sits between five of Iceland’s greatest volcanoes. The main exhibition of the Centre reveals the epic forces of nature that shape our planet and created Iceland. In addition visitors get a crash-course in Volcanology while experiencing the extreme forces associated with volcanic eruptions and earthquakes. Main focus is on the massive volcanoes surrounding the Museum, Hekla, Tindfjöll, Katla, Eyjafjallajökull and the Westman Islands. “The competition for guest at exhibitions, museums and other activity based events is rapidly increasing. Therefore quality design is even more important. Museums and exhibitions have a very important role in society and can facilitate increased understanding of where we come from and where we are heading. Great exhibitions are intriguing, create reaction and has the guest asking them self questions when they leave,” says Kristín Eva Ólafsdóttir from Gagarin. Basalt architects designed the building. The exhibition design was done by Basalt Architects and Gagarín in close collaboration with the Geologist, Ari Trausti Gudmundsson, Liska, Irma Studio and Feris. Silver Prize at the European Design Awards 2018 in the category of “Digital installations”. Notable honor in “Design Education Initiative” category at the Core77 Design Awards 2018. “Project of the Year” at the Reykjavik Grapevine Design Awards. Three awards at The Association of Icelandic Graphic Designers Awards 2018 (FÍT Awards) in the category of Information Design, Interactive Design and Grand prize; “best of show”. “These multiple awards confirms that the exhibition is truly world class and it explains the positive response we’ve had our first year in operation,” says Bárður Örn Gunnarsson, CEO of LAVA Centre. The origins of the Red Dot Design Award date back to 1955. Its distinction, the Red Dot, is established internationally as one of the most sought-after quality marks for good design. The products, communication projects and concepts entered in the Red Dot Award are evaluated by a jury. It is comprised of independent designers, design professors and specialist journalists. The award ceremony and the formal opening of the exhibition for all the winning designs will be held in Konzerthaus Berlin October 26.